Claustrophobic, as the name suggests, involves playing a game in a space that is collapsing, where the room to play reduces over time. The game makes clever use of the accelerometer built into the Apple devices to allow the player to control the game by tilting the device. Carefully designed from the beginning, the timing of the game has been set to provide the player with a pace that is fun, challenging, and very playable. Through successive levels of the game, new features of the game are discovered, adding complexity and challenge as the player becomes more proficient. 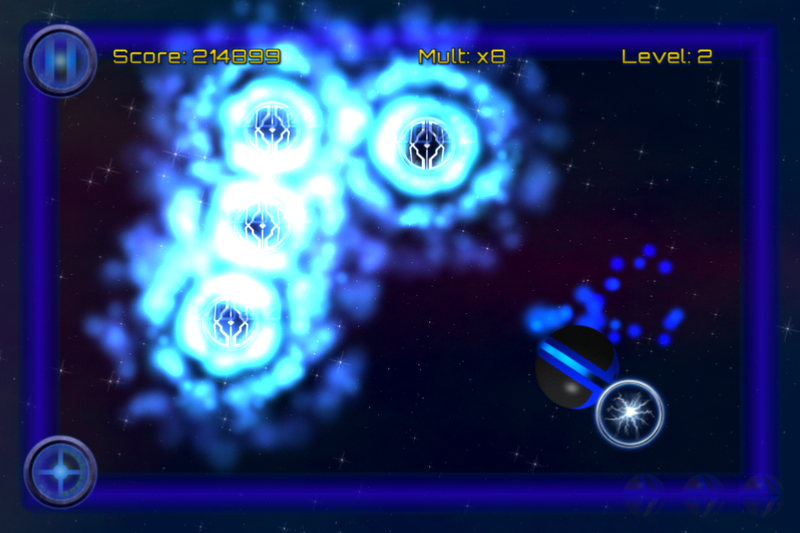 Claustrophobic treats the player with bonus lives and powers as they reach higher levels. 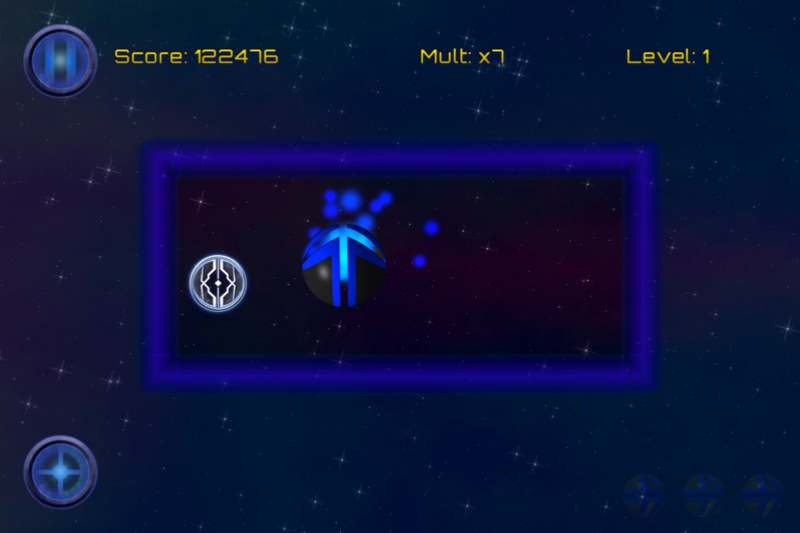 These in turn allow the player to keep the game going; to build a higher score. They can also be purchased as in-apps, both outside a game and whilst it’s running. High scores can be shared with friends and other players via full Game Center integration. It is also possible to share scores and screenshots with others via Twitter and Facebook on devices running Apple’s iOS 6.0 or later. One extraordinary feature is the ability to record a game, and share that game as a video with others via Facebook, Twitter, YouTube or email. The artwork that gives Claustrophobic it’s on-screen pizazz has all been carefully crafted to look beautiful on all of the Apple devices, including the latest iPad Retina and iPhone 5. Claustrophobic is a universal app, and works equally well on iPad, iPhone or iPod Touch. It requires iOS 5.1 or later. Personally, I love playing it on my iPad Mini. Requirements: Universal (works on iPad or later, iPhone 4 or later, iPod Touch 4th Gen or later), iOS 5.1 or later. About mid 2012, having spent a lot of time working on apps for education (either mine or others) I was feeling like doing something different. Whilst working on the educational apps, I had also been helping another developer with his game, and this prompted me to put my own game together. And now, on the 18th of January, Claustrophobic will be launched in the Apple App Store. It’s taken me about 6 months of calendar time to do, but in reality, if I tracked my time, Ive probably spent about 3 months to put this together. For me, this is a long time. I’ve really enjoyed putting this game together. It has some really interesting features, some of which haven’t been included in the first release because I want to be able to keep improving the game over time. The games name is a fun story. Originally, the game had a working title of “keep it rollin”, and every time I wanted to test it on one of my kids devices they’d groan. When the game was nearing completion I asked them what should I call it? Well they both had ready answers. One name was already taken in the store, but Claustrophobic was not, and it’s such a great name, so we ran with it. It gives my kids a connection with what I do, and a feeling of being involved. Both of my kids have help with testing. I look to them as a gauge of whether the game is fun to play or not. If I don’t get the thumbs up from them, then it’s back to the code I go. My fave feature of Claustrophobic would have to be the “wormhole” obstacle. Once you get to level 4 in the game a new obstacle can randomly appear. If your ball falls within it’s gravity well, it is sucked in, and transported somewhere else on screen. I’m really pleased with the visual effect I created for this. I also love the design of the game. It’s one I can keep adding to; increasing the player experience with updates will be fun for me as well as them. To be honest, when I started on Claustrophobic it was just to make a fun game. I had no real goals of education, etc. But now that it’s done, and about to be released, I can see that the ability to control the ball effectively requires skill and good hand-eye coordination. I don’t know how well this will translate to being an aid for anyone, but I’ve been surprised in the past as how creative people can be. I really think that Claustrophobic can be fun for anyone able to hold and manipulate an iPad, iPhone or iPod Touch. Age isn’t necessarily a barrier, though I’d probably say 5+. Kids are very clever with these devices; it’s amazing what they can do. That being said, I should caution parents that as this game has not been written exclusively for kids, it does have in-app purchases, and it does have social media (Facebook/Twitter) integration. Both require passwords and authentication, but I don’t want anyone to think I’m wanting these features of the game to be specifically used by kids. I’m a firm believer that social media is not for kids. Claustrophobic will be released on the 18th of January. It will be FREE, and it will work on any Apple devices such as the iPad 2, iPad Retina, iPad Mini, iPhone 4/4S, iPhone 5 and iPod Touch 4th/5th gen. Personally, I love playing it (and other games) on my iPad Mini; it’s the perfect device for games. Thanks to The Appy Ladies for the opportunity to talk about my latest app. Please, if you download Claustrophobic, rate and review it in the app store.